Biju Patnaik International Airport (IATA: BBI, ICAO: VEBS), also known as the Bhubaneswar Airport, is the primary international airport serving Bhubaneswar, the capital city of Odisha. It is situated around 4 kilometres (2.5 mi) south-west from Bhubaneswar railway station and 6 kilometres (3.7 mi) away from the city center. Named after the former chief minister of Odisha, Biju Patnaik, a famed aviator and freedom fighter, it is the 15th busiest airport in India & 11th busiest among the airports maintained by Airports Authority of India, registering a 39.4% growth in traffic over the previous year. The airport was dedicated to the people of Odisha on 17 April 1962, becoming the first ever commercial airport of state. The airport boasts two active scheduled passenger terminals i.e. Terminals 1 and 2 for domestic and international passengers respectively. Former Minister of Civil Aviation, Ajit Singh, on 5 March 2013, inaugurated Terminal 1 which caters domestic passengers whereas, the Terminal 2 was then refurbished to handle international operations. The Government of India accorded international status to the airport on 30 October 2013. Biju Patnaik International Airport serves as one of the major civil aviation hubs in Eastern India. The airport boasts two active scheduled passenger terminals i.e. Terminals 1 and 2 for domestic and international passengers respectively. Inaugurated in March 2013, the terminal has a capacity of 4 million passengers per annum and was built at a cost of ₹1.45 billion. The new terminal has been developed by the AAI as part of the upgrade of 35 non-metro airports across the country. Terminal T1, a two-storied building with a total area of 18,240 square metres (196,300 sq ft), consists of 2 aerobridges, 4 elevators, several escalators, 18 check-in counters, 3 arrival luggage conveyors, a spa, and multiple seating areas. Apart from the Departure and Arrival Lounges, T1 terminal also has several other lounges, including VIP Lounges, Pal Heights Spa Lounge, Dakota Lounge and Mayfair Lounge. The terminal is environment-friendly, built according to green building standards, with sewage treatment plants and provision for rain water harvesting. The internal walls of the terminal are decorated with tribal motifs, designs, masks, and sculptures derived from Odisha's culture. The new terminal also has food kiosks, gift shops, bookstores, art galleries and handloom/handicraft kiosks. The terminal was built by Lanco Infratech (Octamec). Terminal 2 handles international operations to and from the Biju Patnaik International Airport. It was built in the mid 1960s to cater domestic flights. The terminal being built over an area of 5,178 square metres (55,740 sq ft), consists of 6 check-in counters, 10 immigration counters, 4 customs counters, numerous amenities and multiple seating areas. A link building connecting Terminal 1 and 2 is being constructed with a budget of 87.2 crore. It will be mostly used for international arrivals. Terminal 3, is a proposed passenger terminal, to be set up at a cost of ₹9.3 billion with a total area of 58,000 square metres (620,000 sq ft). The terminal would handle 8 million passengers per annum, expanding Biju Patnaik International Airport's capacity to 11.5 million from 3.5 million passengers per annum. The construction work for the terminal is poised to begin in July 2019, with a given construction duration of three years. This terminal, once completed would handle domestic passengers, and the existing terminals 1 and 2 would then cater international passengers. The Coast Guard Air Enclave along with the 743 Dornier Squadron was commissioned by former Vice-Admiral Anurag G Thapliyal, Director General of the Indian Coast Guard in Biju Patnaik International Airport on the 15th of December 2014. The units operate under the operational and administrative control of the Commander of the Coast Guard Region (North East) through the Commander, Coast Guard District No 7 (Odisha). Several strategic air operations are streamlined and synergized for the protection of the sea areas off the Coastal Odisha. The nearest railway station from the airport is Lingaraj Temple Road Railway Station i.e. 3 kilometres (1.9 mi) away whereas the main station Bhubaneswar Railway Station is 5 kilometres (3.1 mi) from the airport. The airport is well connected to the main city by the means Odisha State Road Transport Corporation, Bhubaneswar City Bus and Mo Bus services plying to remote locations across the city as well as Odisha's neighboring states. Biju Patnaik International Airport is 4.9 kilometres (3.0 mi) from the Interstate Bus Terminus (ISBT) at Baramunda i.e. the main bus terminus in the city. On 22 December 2007, while Surya Kiran, Indian Air Force's aerobatics demonstration team, was undergoing training exercise, one of its four HAL HJT-16 Kiran jets, after refueling and takeoff, caught fire and crash landed on the runway of Biju Patnaik Airport. The pilot was safely rescued with minor injuries and the exercise was immediately called off after the mishap. ^ "Bhubaneswar Airport". Airport Economic Regulatory Authority. Retrieved 3 January 2019. ^ a b c "New terminal at Bhubaneswar airport starts operations". Business Standard. 14 March 2013. Retrieved 17 March 2013. ^ "Centre accords international tag to Bhubaneswar airport". The Times of India. 31 October 2013. ^ Barik, Bibhuti (8 August 2011). "March date for swanky airport". The Telegraph. Calcutta, India. Retrieved 17 March 2013. ^ Barik, Bibhuti (24 June 2011). "Airport work speeds up — Capital set for take-off in style". The Telegraph. Calcutta, India. Retrieved 17 March 2013. ^ "New terminal at Bhubaneswar airport thrown open". Times of India. 6 March 2013. Retrieved 17 March 2013. ^ Ramanath V, Riyan (5 February 2013). "Plans to provide spa facilities at airport". Times of India. Retrieved 18 March 2013. ^ "Lanco Infratech bags Rs 92 cr order from AAI". Business Standard. 4 June 2010. Retrieved 30 December 2013. ^ "Bhubaneswar - Technical Information". Airports Authority of India. 22 August 2016. Retrieved 25 May 2017. ^ "Bhubaneswar airport to get new terminal soon". 23 February 2019. Retrieved 23 February 2019. ^ "AAI sets the ball rolling for new airport terminal". 30 October 2018. Retrieved 2 January 2019. ^ "Biju Patnaik International Airport Poised To Get Third Terminal". 3 December 2018. Retrieved 2 January 2019. ^ "Centre To Expand Biju Patnaik International Airport At Cost Of 930 Crore". 4 December 2018. Retrieved 2 January 2019. ^ "Coast Guard's new air enclave inaugurated in Bhubaneswar". 15 December 2014. Retrieved 12 October 2016. ^ "Commissioning of Coast Guard Air Enclave Bhubaneswar & 743 Squadron (CG)". 15 December 2014. Retrieved 12 October 2016. ^ "Airport Movement Report" (PDF). 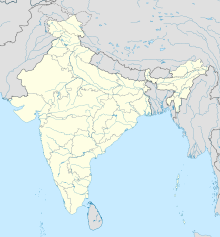 Directorate General of Civil Aviation (India). Retrieved 3 January 2019. ^ a b "Foreign Carriers" (PDF). Directorate General of Civil Aviation (India). Retrieved 3 January 2019. ^ "Bhubaneswar Airport". Cleartrip. Retrieved 3 June 2018. ^ "DTS City Bus - Travel Information Book" (PDF). Retrieved 3 June 2018. ^ "Mo Bus Network Map". Retrieved 3 January 2019. ^ "IAF aircraft crash landed at Bhubaneswar airport". Retrieved 3 January 2019. Airport information for VEBS at World Aero Data. Data current as of October 2006.